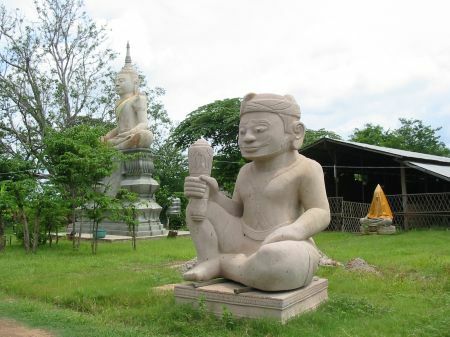 I decided to Udong on Saturday, which used to be the capital of Cambodia from 1618 to 1866. 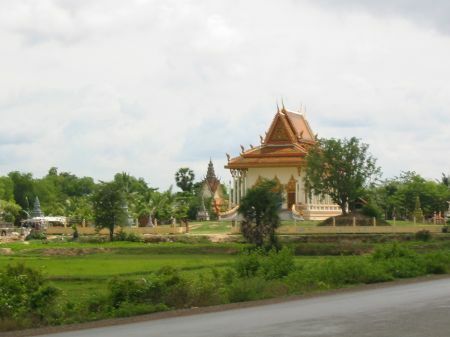 Udong is about 45 km north of Phnom Penh (PP). The general means of transportation in Cambodia appears to be the moto and I concluded this would be a good chance to learn driving it. I met Tang from the partner organization and he was willing to give me company for this trip. 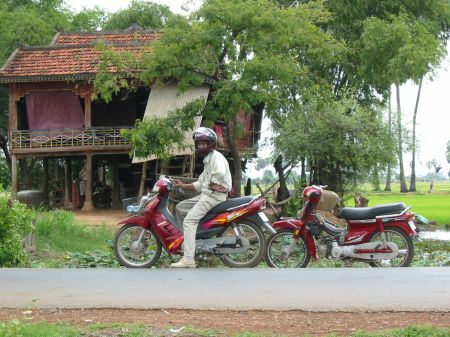 We went together to the moto rental service â€˜luckyâ€™, where I got a simple moto for three bucks the entire day. However, it was in the center of the city and I had to learn driving first on the chaotic road and than on the truly anarchic road outside the capitol. The street follows outside PP mostly the Tonle Sap, which is a major river and flows into the Mekong in PP. The picture was taken about 10 to 15 kilometer outside PP. Wooden ships on the shore can carry about 200 metric tons, I was told. What gets discharged here is wood, which comes from various provinces and gets loaded on trucks to be used mostly for cooking (heating really is not necessary around here, at least in July). In the background people are fishing. 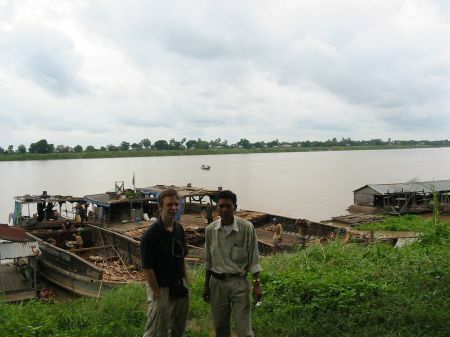 There are many fishing boats on the river and there nets span from one waterfront to the other. At least, so I was told. 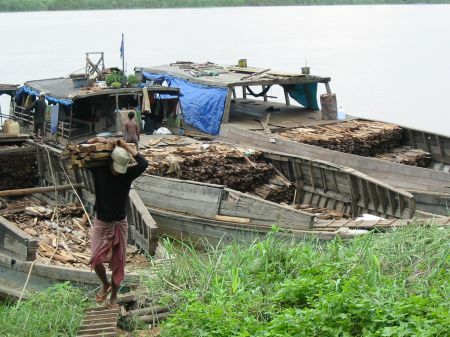 The discharging of this cargo is associated with hard physical labor. On the way I saw many Pagodas and a few Mosques, among them this one. A very old man told me this is a very old mosque. However, I doubt this. 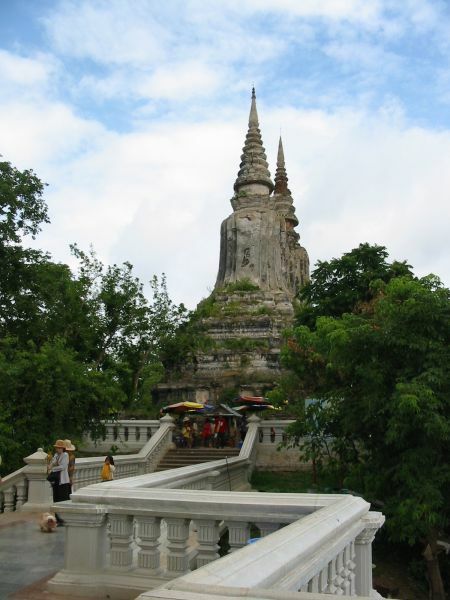 This is one of the Pagodas. Maybe it is my ignorance that leads me to call it like that. When I saw this first I thought this must be really old and is really cool. However, it turned out not to be really old. 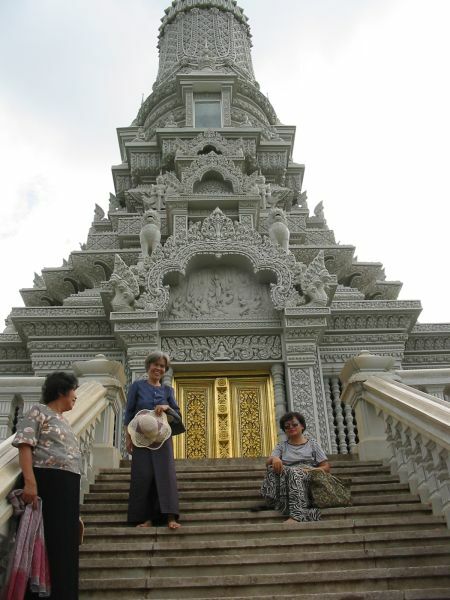 The structure as well as most of the ornaments appear to be from cement. 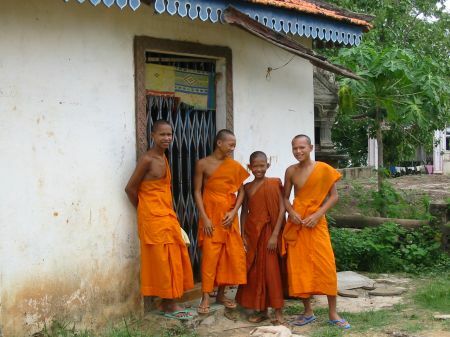 Also these monks where very cool. I learned that they are students. I wish to point out that whenever people are in my pictures I ask them before I take it. And I want to stress that I did not give this fellow a cigarette or encourage him to smoke his. He just happened to light his cigarette while I was taking pictures. 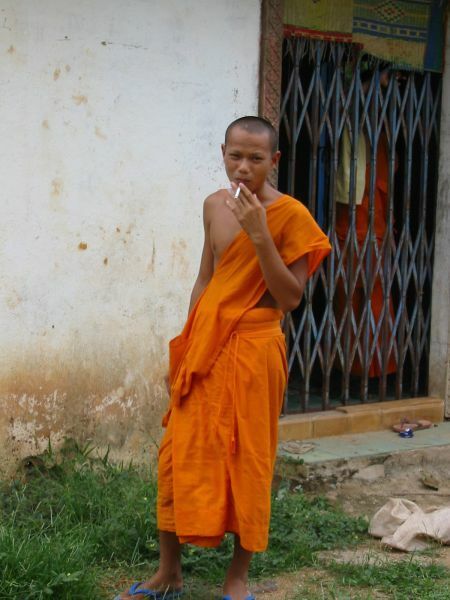 I told him he is the first cigarette smoking monk I encounter and that I thought monks are not supposed to smoke. He did not mind me taking this picture. Again, I did not make this monk smoke. 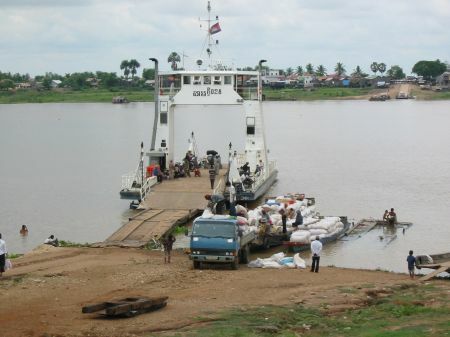 This is the ferry which crosses the Tonle Sap at Prek Kdam. There appear to be many rivers in this country but only few bridges. By the way, this seems to be true in large part of the society as well. Particularly with regard to the behavior of political parties towards each other. They are campaigning for the upcoming election on July 27th. This is a major connection for the national roads 5 and 6. 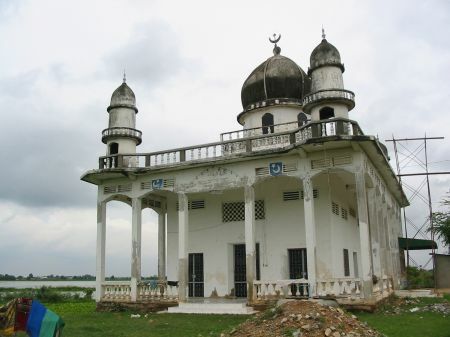 Prek Kdam is said to be populated mostly by Moslem Cham. Except a few mosques I did not see much difference while passing with 20 km per hour. 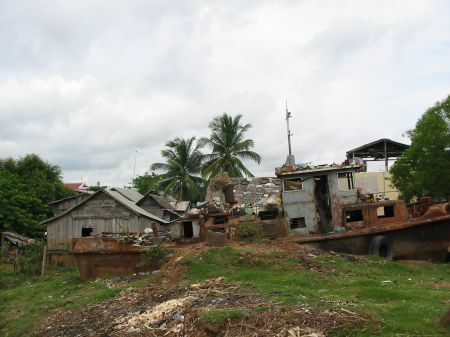 I was told that some people are poor enough to actually live in this wreck. This was one of the many modern style pagodas I saw so fare. Other than this one (the construction is probably not yet finalized), they are usually (from what I saw so far) painted in yellow and have, like this one, colorful roofs. 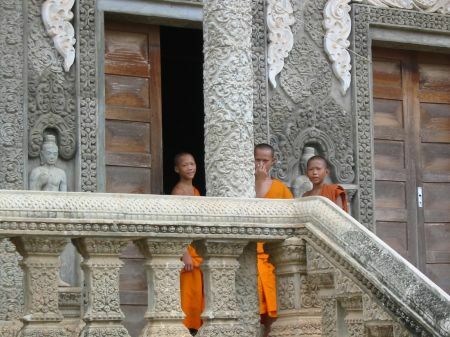 All sorts of religious constructions of various ages can be found on the compound of any pagoda. Another pagoda out of so many. I found a strong contrast between the poor conditions of many citizens and the number and opulence of all these pagodas. This is how the scenery looks like most of the time. Except for rice fields, which are usually more dominant. 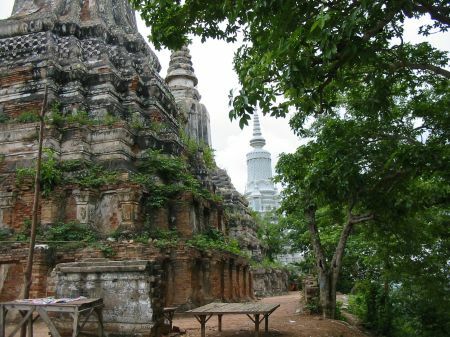 On the right hand from the tree in the center of the picture one can recognize the top of the stupa on the hill next to Udong. From this piece of street it can be seen that this is quite good quality. This is not exactly true of the way many people drive on it. This is my companion Tang sitting on one of the motos, on which we came here. 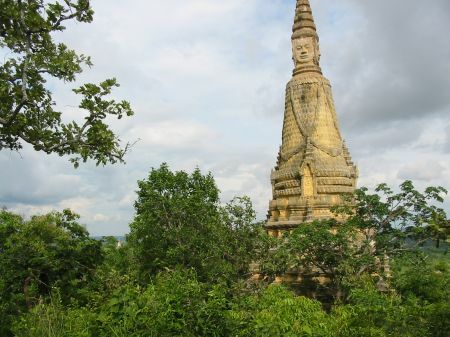 This is the biggest stupa on the mountain (which is about 55 meters). The inauguration ceremony took place only some month ago, with the king and queen as well as prime minister Hun Sen being present. 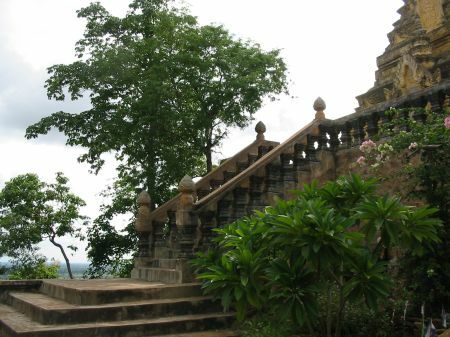 This stupa houses some bones and a tooth (behind the window in the upper part) which are said to be from Buddha himself. From up here one has a great view over the surrounding landscape. At the bottom of this hill is the compound of a major pagoda, which most likely cannot be recognized on this small picture. The turning handrail is due to my camera. On the other side of the mountain constructions are going on to build another huge pagoda. Also at the bottom of this hill lies the small village Phnom Udong. Again, this place used to be the capital of Cambodia from 1618 to 1866 and King Norodom was crowned here. 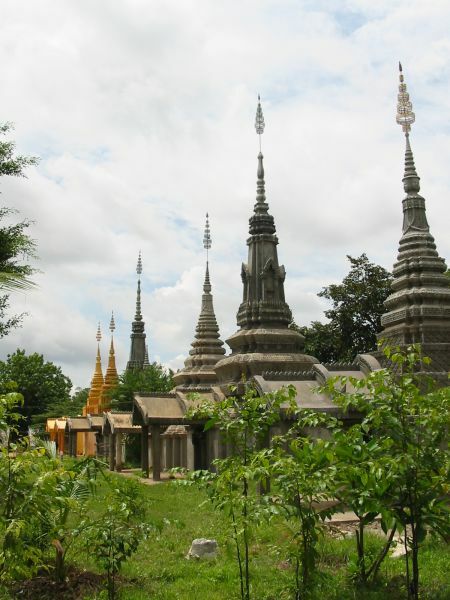 There are many stupas, all sorts of sanctums and Pagodas around here. Much of it has been damaged or destroyed (like so much in this country, one feels tempted to think) by the operations of several military confrontations, not least the dropping of bombs of the Lon-Nol-Military. Those are older stupas. The first one houses the remains of King Soryopor. 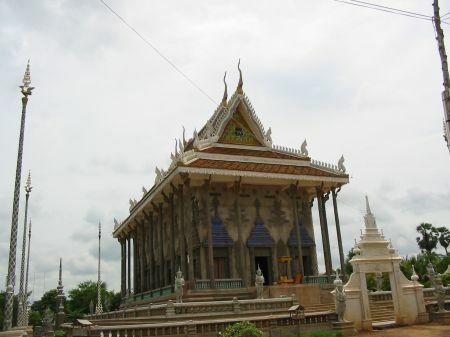 The second one is inhabited by the corpses of King Norodomâ€™s father King Ang Duong. I found many poor and partly old people sitting on the stairs which lead to these monuments, begging for money. 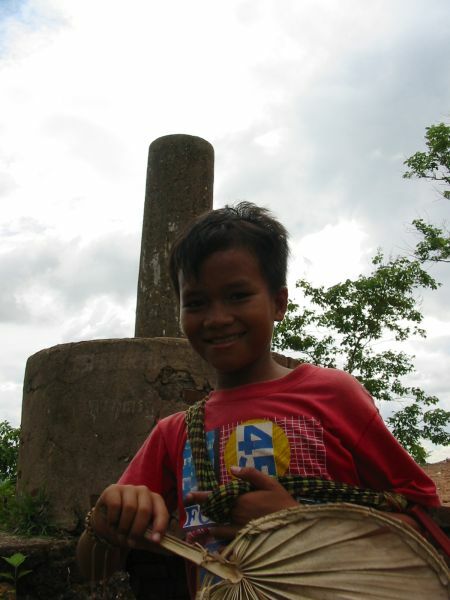 In addition, there are many children trying to sell soft drink and refreshing visitors. With this flabellum-like device they produce currents of air for sweating tourists climbing the 500 or so steps, hoping for some compensation later on. 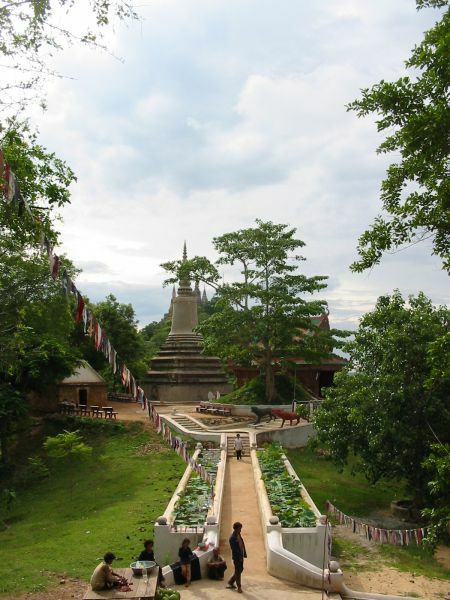 In this stupa are the ashes of King Monivong who ruled from 1927-1941. It can be reached via those beautiful stairs. There seems to be the will to reconstruct this place, including new stairs and this way. 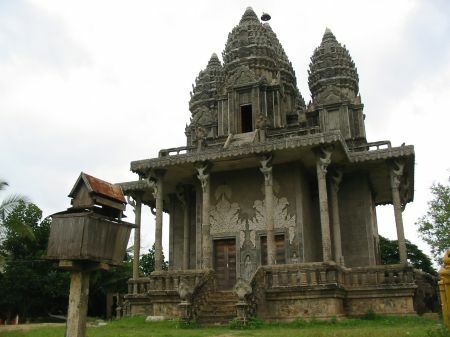 This is most likely due to the fact that politics in Cambodia is tight to both the Crown and religion and this place in turn symbolizes either of those. On our way back, maybe about 20 km from PP, it started raining heavily. Obviously I could not take any more pictures. This rain involved heavy lightening and thunder (which destroyed a medium village close to PP, as I learnt from the Cambodian Daily the other day). This was an interesting experience. Fortunately, Tang had two raincoats with him. However, when we put them on we were already pretty wet. My helmet did not have a visor and the rain became so heavy that I could not open my eyes anymore. So we waited for the rain to become weaker. Then we continued our journey, while it was still raining strongly. Most roads were entirely up to the axis of the moto. At the same time, the street was very crowded. I found that the rain is warm and delightful and enjoyed the wave of water that was flooding from my front wheel over my feet. It looked like all these cars and moto cycles are driving in a river in the very center of Phnom Penh. And it felt like riding a jet ski rather than a motor bike. When I stretched my feet upfront in the water it was like water ski. We gave my moto back to the rental service and Tang took me back to my guesthouse. 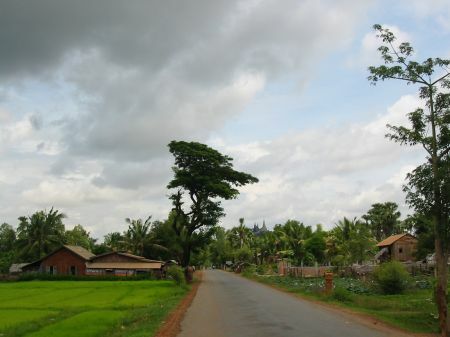 He had to drive another 45 km before he reached his home in Kandal province. At this point, both of our clothing was entirely wet. Sehr beeindruckend. Habe die email heute bekommen und alles hier durchgelesen. Hoffe das du da Spass hast. Bin selber momentan noch in den Staaten und toure durch die ganzen states. Dann Ende July auf Mallorca rumgammeln bevor ich dann wieder nach NYC arbeiten muss.